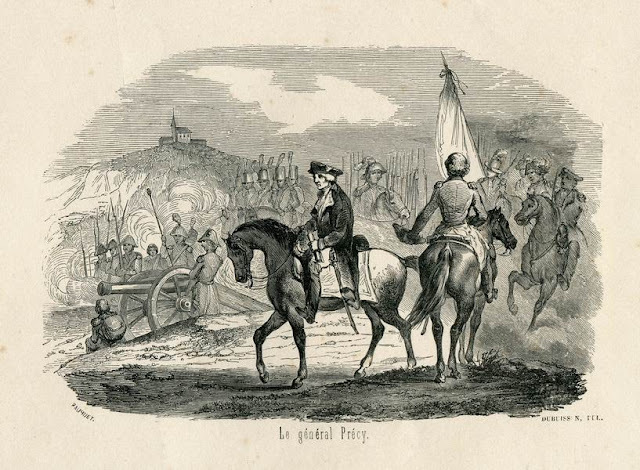 Rodama: a blog of 18th century & Revolutionary French trivia: Lyon - the Revolution in pictures cont. Here are more plates: from the second volume of Alphonse Balleydier's Histoire politique et militaire du peuple de Lyon pendant la Révolution française, 1789-1795, 3 vols. 1845-6. Every conflict, even the grim internecine struggle of the Lyon insurrection, needs its dashing hero. 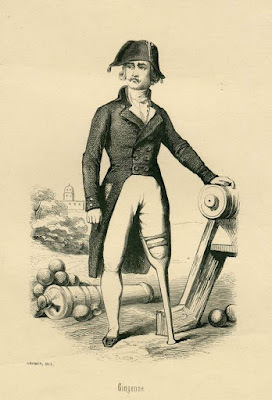 ‎ Benoît Gingenne was a native of Lyon, born in the parish of St. Georges on 13 October 1755. Before the Revolution he had been a career soldier. 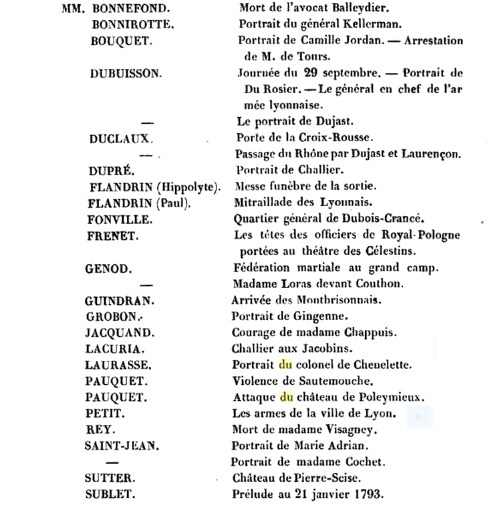 In 1773 at the age of eighteen he had joined the grenadier regiment of "la Couronne" and in 1775 was one of two thousand guardsmen who had attended the coronation of Louis XVI. In 1781, having reached the rank of sergeant, he obtained his discharge, returned to Lyon and became a pork butcher. At the beginning of the Revolution, when the Lyon militia was suppressed, he rallied to the cause and became commander of the batallion of grenadiers in the section of rue Royale. In the events following the King's execution, his batallion had attempted to suppress pillaging of shops by the women of Lyon; the Jacobins despoiled his premises and he was temporarily forced to go into hiding. Gingenne was a prominent participant in the famous journée of the 29 May 1793, commanding a column which marched against the Hôtel de Ville. His horse was shot from under him and he was forced to retreat to the place des Cordeliers, but rallied his men and joined the command of Madinier who entered the Hôtel de Ville the next day. He was named adjutant general of the rebel National Guard. Under the comte de Précy, he was given command of 1200 men who left for Saint-Étienne to seize control of the arms manufactory. He returned with a dozen waggons of guns and took charge of forces stationed in the Carmelites convent. 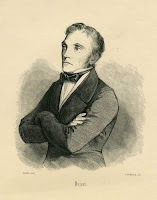 When the rebel forces fell back to the Croix-Rousse, Gingenne was took command of the strategically important post in the gardens of the maison Combe, which came to bear his name, "the inpregnable Gingenne". 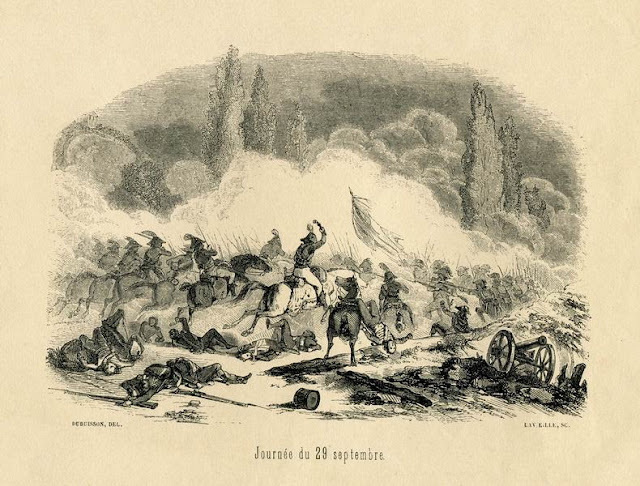 His six companies of grenadiers and six pieces of artillery valiantly defended the plain against the neighbouring battery in the maison Panthod which had fallen to the Convention. After fifty days of combat, on the morning of 27 September, a ball pierced the wall of Gingenne's command room and shattered his leg. He was taken to the infirmary at the Archbishop's Palace where his leg was amputed, an ordeal which he faced with great sang-froid. There is no shortage of legs in la Grenette (Lyon's woodturning district), he quipped. After the fall of Lyon Gingenne managed to escape to Switzerland. He lived in Constance for two years, before returning to Lyon in 1795. Not until 1814 did he receive his reward, when the comte d'Artois made him Chevalier of the Order of St Louis and gave him a pension. He died in October 1825 at the age of 70 and was buried in the Cimetière de Loyasse with full military hoonours. This picture depicts another conspicuous episode of heroism on the part of the defenders of Lyon. 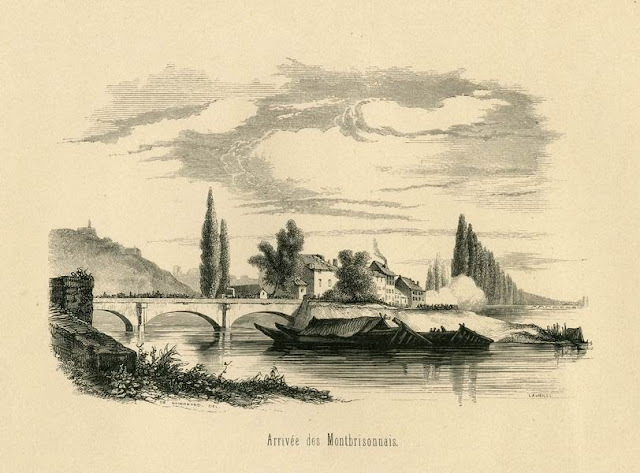 A great deal of damaged was being inflicted by enemy retrenchments on the left bank of the Rhône which were protected by great pieces of wood. 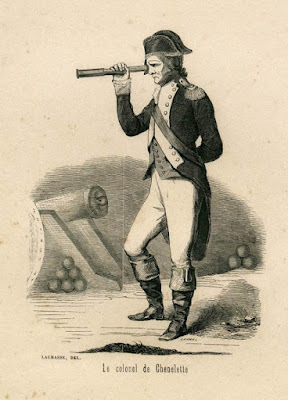 Under the watchful eye of Précy a military engineer had tried in vain to cross in a boat and set them on fire. Two youngful Lyonnais soldiers, Larençon et Barthélémy Dujast then took up the challenge. They bravely swam across the river by night, set the fortifications alight and returned under a rain of enemy bullets. Dujast was carried by the current to the pont de la Guillotière but, taking courage from a prayer to the Virgin that his mother had taught him, finally managed to gain the shore. The young men steadfastly refused to accept any reward for their exploit. This scene serves to demonstrate the ferocity shown by the Jacobins in the final stages of the conflict. 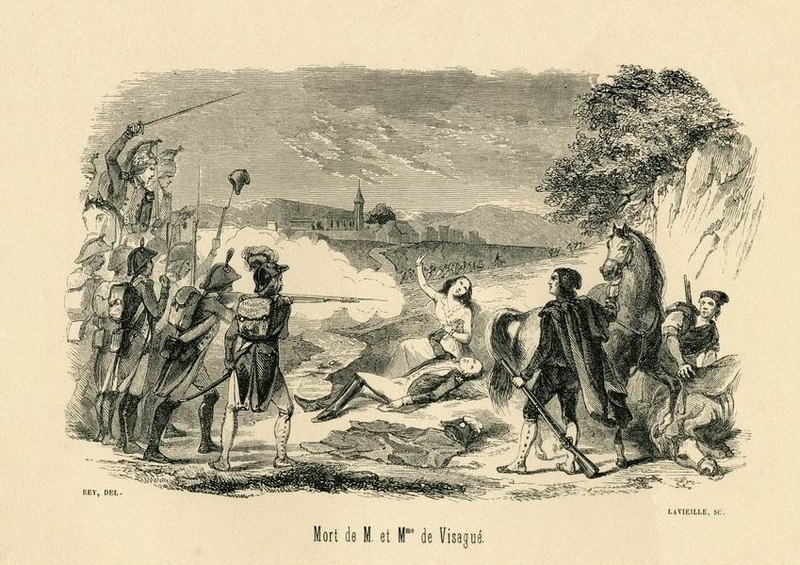 Following the capture of the rebel-held château de Chazelles, Republican troops were said to have murdered Madame de Visague, a young woman of seventeen who would not abandon the body of her husband. On 5 September 1793, in the final stages of the siege, the remnants of the Departmental Army arrived in Lyon from Montbrison in Le Forez. 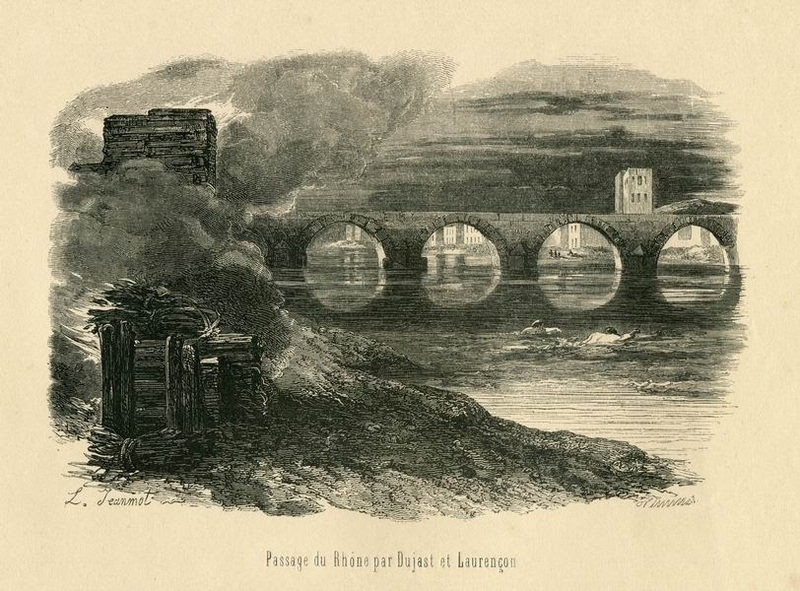 A column some four kilometres long comprising 800 men, accompanied by waggons and civilians, crossed the Saône via the pont du Change to the enthusiastic welcome of the defenders. Despite courageous engagements, notably the capture of the loge du Change, the reinforcements could do little to prevent the fall of the city on 9th October. 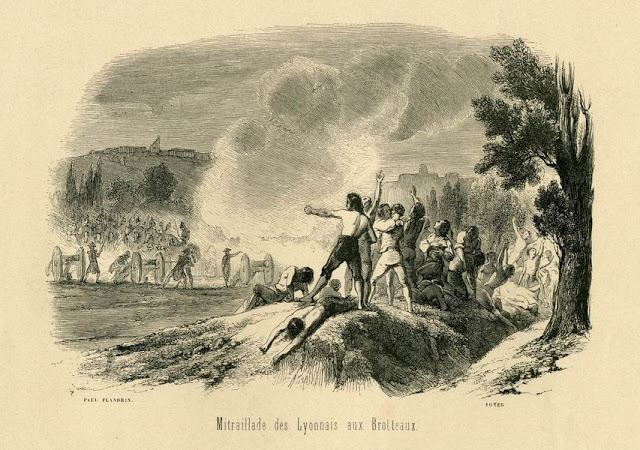 Janmot wished to recall to the Lyonnais " names and the features of their heroic ancesters, defenders of their town against the invasion of the barbarians and executioners of 1793" . By the end of September 1793 Lyon was surrounded by 60,000 enemy troops. On 29th the forces of the Convention launched a series of attacks on the fortified perimeter. The Lyonnais successfully repelled assaults at La Mulatière, Perrache et les Brotteaux, but with heavy losses. Realising that the situation was hopeless, Précy now prepared his troops to break out from the city and retreat. 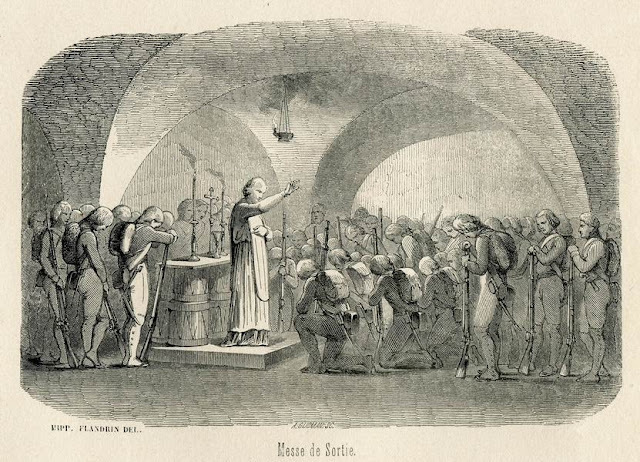 At five o'clock on the morning of 9th October Précy joined fifty officers and men in a cellar in the place croix-Paquet to celebrate a Catholic Mass before their departure from Lyon. The priest, a volunteer in the army, took off his uniform to officiate and an altar was improvised from drums. Jean-Mathias Loras, member of the rebel municipality, was among the first to be executed by the victorious Jacobins. 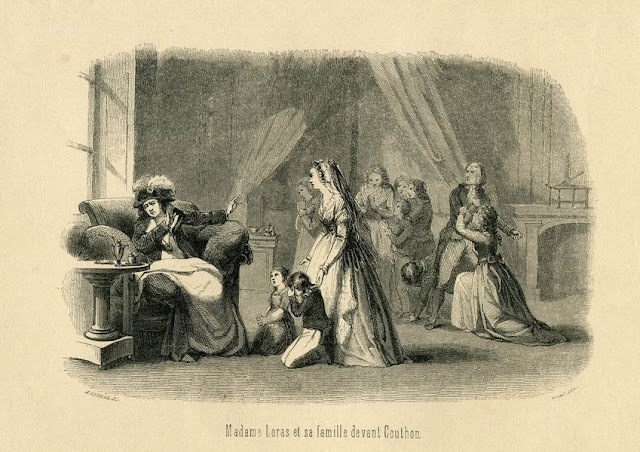 Madame Loras, with her eleven children, pleaded on his behalf to Couthon but to no avail. The Revolutionary Tribunal reportedly gave her what she thought was a letter of reprieve but which turned out to be an order for her husband's execution. In reality, as an active insurgent, Loras can scarcely have hoped for clemency. Jean-Baptiste Agniel de Chenelette (1739-1823), a former noble and career army officer, was the chief architect of the defences of Lyon during the siege. 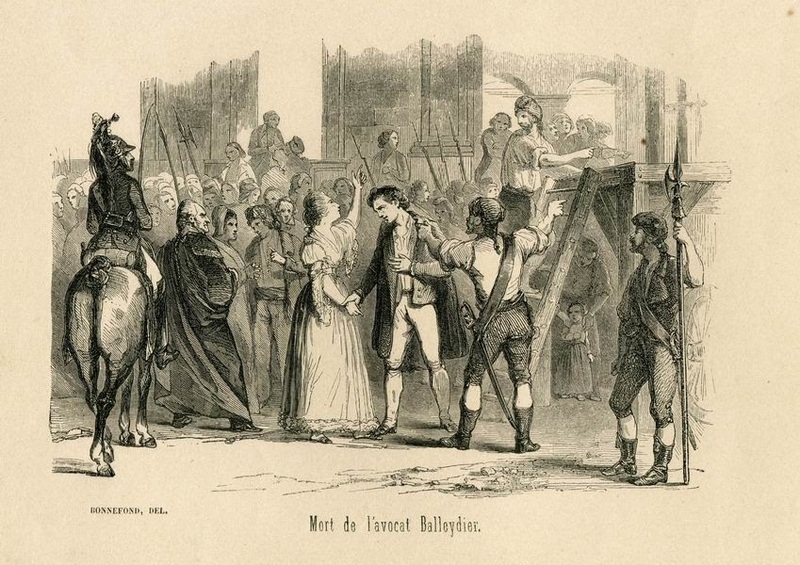 Jean Louis Balleydier, a 30 years old lawyer, was among several men denounced to the Revolutionary Tribunal in Bourg en Bresse as royalists and guillotined in Lyon on 14th February 1794. In the confusion preceding the execution, his fiancée was able to throw upon her beloved and promised very movingly to join him soon; two months later she was dead. The episode depicted is the transfer of prisoners from St-Étienne, Montbrison and Feurs to Lyon for imprisonment and execution in January 1793. It is not quite certain who is depicted: M. Gerbes de Tours was a lawyer from St-Étienne. The picture is sometimes alternatively said to represent a M. Delours whose eighteen-year old daughter followed the entourage from Feurs. Hi, thank you for sharing this interesting material. Although coming from a book that is clearly very hostile to the Revolution, it is good to see you have made an effort to maintain a detached and objective perspective. 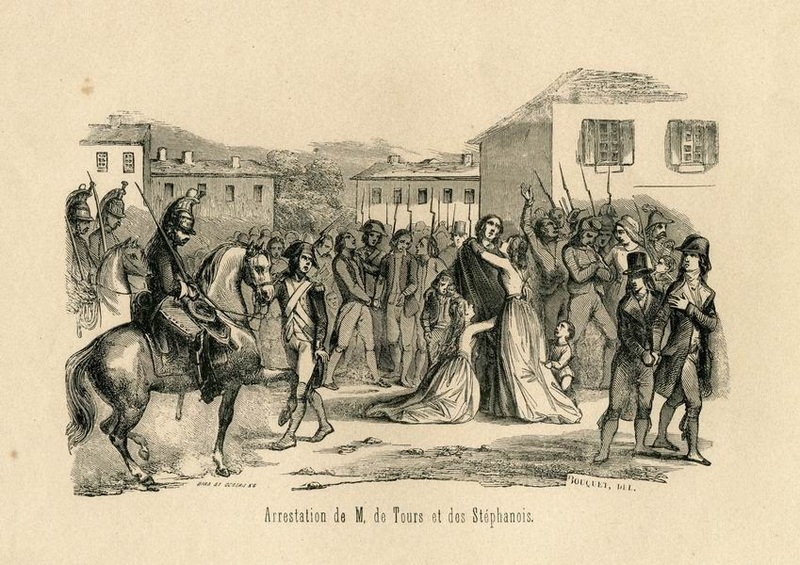 Just a slight detail I would add with regard to the translation of the title of one of the illustrations: un Stéphanois is French for an inhabitant of Saint-Etienne, not a personal name. Thanks again for allowing me to discover this book, and for plentiful references, I do very much enjoy reading your blog.